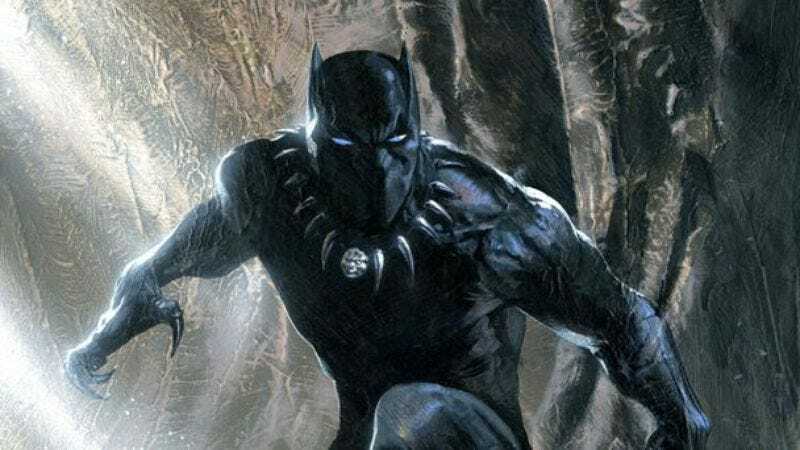 We’ve known since May that Chadwick Boseman’s Black Panther will be making his first appearance in the Marvel Cinematic Universe in next year’s Captain America: Civil War, but most people probably don’t want to wait that long before they can see what he looks like. If the internet can be defined by one thing, it’s impatience. We want our movies to stream without buffering, we want our songs to download in an instant, and we want to see what a superhero is going to look like the instant an actor puts on their tights for the first time. Luckily, the time-honored practice of hanging out near movie sets with fancy cameras that can zoom in forever will never go out of style, so those lovable spoiler-makers will always be there to watch our backs (from very far away as they sneak photos of us in superhero costumes). Those photographers—heroes in their own right—have come through once again, and ComingSoon has uploaded a whole bunch of sneaky pics from the set of Captain America: Civil War. There are some photos of Chris Evans checking his phone (or maybe Steve Rogers checking his phone) and Anthony Mackie gesturing at things with his hands, but for once the really exciting stuff comes from people who aren’t famous at all: stunt doubles. Included in ComingSoon’s gallery are a number of shots featuring the stunt doubles for Captain America, The Winter Soldier, and The Black Panther in-costume and hanging out on a rooftop. That means this is our first look at the actual movie version of the Black Panther costume, but you’ll have to click on that link above if you want to see it. If you don’t want to click that link, either because you think it’s a spoiler or you prefer to get all of your news from The A.V. Club, we can confirm that it looks a lot like the concept art that Marvel released last October. Like, a lot like it. Seriously, the concept art is below, just look at that. But, if you really can’t stand to wait, click on the link above to see a stuntman wearing it. Whichever you’d prefer.